Scarf Print Midi Shirt Dress is rated 5.0 out of 5 by 3. 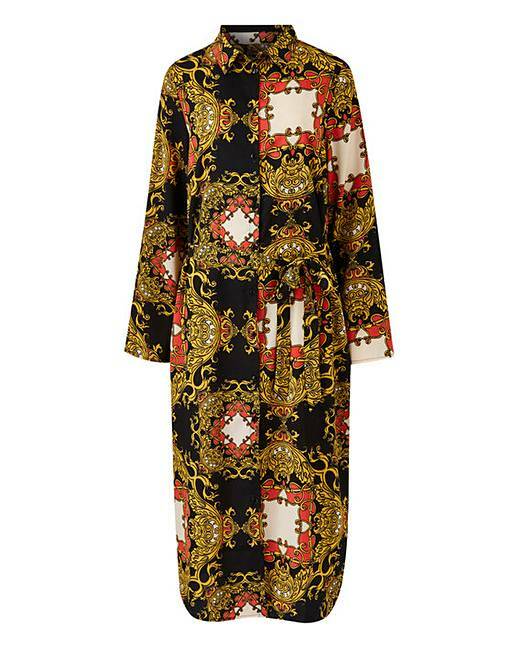 Featuring an all over on trend scarf print, this dress is the perfect addition to your wardrobe. Featuring tie waist fastening and designed with long sleeves that can be worn down or turned up to a three quarter length with a button and tab fastening. This midi shirt can be teamed with gold accessories to create an ideal am to pm look. Rated 5 out of 5 by Kellya from Gorgeous & Flattering I bought this dress to wear for my neices baby shower and it fits perfect and looks lovely on I cant wait to wear it. Rated 5 out of 5 by Helen LP from Beautiful flattering dress I bought this for a birthday party and it looks gorgeous! Got so many compliments and flatters in all the right places. Can be dressed up or down.